I like it but there seem to be a few mistakes here and there, for example, the paws aren't sensory organs, or if they are you haven't explained how. another problem is pupil-less eyes being a nighttime adaptation, it's actually the bigger the pupil the more the organism is adapted to nighttime activity, so maybe the pupil encompasses most of the vulpix's eye? Paws are totally sensory organs! They're part of the vulpix's skin aren't they? this is amazing keep up the great work. 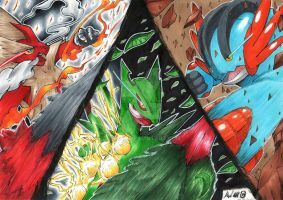 One of favorite generation one pokemon. What program did you use to make this? Interesting. I'm wondering what is anatomy of an Alolan vulpix. Could please do an anatomy of an Alolan Vulpix? Interesting, but what about the Alolan Vulpix? What adaptations do they have? just replace the fire of Kantonian Vulpix with ice. "Spewing a fiery stream of chemicals from Vulpix's digestive orifices to deter predators"
So what you're basically saying this that a Vulpix shits fire? I estimate a Vulpix may have learnt it from a Skuntank. Sounds a bit like you took nods from the real-life bombardier beetle for Vulpix's defenses. Quite unexpected. If Vulpix has no pupils, how can it see? O__O If the eyes were adapted for nighttime hunting, shouldn't they have extra big pupils? What if they're all pupil? Yes I have been waiting for this one GOOD JOB! "...spewing a fiery stream of chemicals from Vulpix's digestive orifices..."
bad idea to stand behind one who has bad case of farts eh?